Most circuit breaker life cycles are based on periodic maintenance inspection and operation specified in the manufacturer’s circuit breaker instruction manuals in order to have longevity. However, as technology, reliability, and safety needs have evolved in the energy market this has a created a need to look at upgrading these older obsolete breakers. And while there has long been a secondary market for obsolete breakers, maintaining them is challenging, and using them can even be risky. Thus, let’s take a look at some of the misconceptions and realities surrounding obsolete circuit breakers. 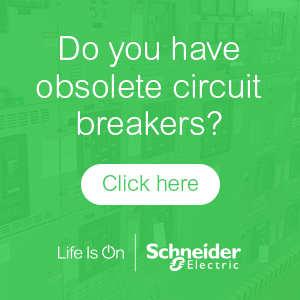 Myth: Maintaining an obsolete circuit breaker is more cost-effective than replacing it. Reality: Not exactly. Yes, maintaining an obsolete breaker, particularly if it’s a recently decommissioned model, can be less of an upfront investment. In the long haul, however, cost savings will dwindle. The availability of spare parts presents the biggest (and most costly) challenge in maintaining obsolete breakers. Over time, acquiring spare parts necessary to keep the breaker in working condition becomes harder and more expensive. While you may find, say, an old Square D breaker on eBay that’s identical to what’s used in your facility, its scarcity may mean you have to pay 7-8 times the original cost. There comes a point where maintaining becomes cost prohibitive and the most cost-effective course of action is to go with a newer, modernized solution. Myth: Purchasing a refurbished breaker is a safe option. Reality: Even if purchased from a reputable seller, using a refurbished or reconditioned breaker can still introduce risk. Since the equipment is not coming directly from the manufacturer, its traceability is lost, and you don’t really know where the parts or the breaker have been. Plus, refurbished breakers are not endurance tested to the manufacturer’s standards — especially for molded case breakers. The reconditioning world claims to meet industry and manufacturer standards, however, they test to the InterNational Electrical Testing Association (NETA) standards which differs from the manufacturer’s, which are Underwriters Laboratories (UL) or American National Standards Institute (ANSI). If the equipment doesn’t meet the original requirement, it can lack safety features and other critical specifications. Myth: Obsolete breakers can meet the same national testing standards as new equipment. Reality: While not impossible, this is extremely challenging and uncommon. Originally, the breaker was developed and designed for the standards of that time. As such (and if at all possible), a great deal of retrofitting would be needed in order to get the equipment in compliance with newer standards. Myth: Replacing an obsolete breaker means replacing all my equipment. Reality: There are several options for replacing an obsolete breaker. If the infrastructure is still in good shape, then the breaker can easily be upgraded with either a direct replacement or retrofit solution. Both are designed to fit within existing equipment with minimal modification and downtime. If an extended period of operational downtime can be afforded, then replacing with new equipment is a viable option. In cases where the obsolete breaker is situated in a hard to reach location and bringing in new equipment would be extremely challenging and costly, modernizing is the only option. Reliability: By upgrading to newer technology you automatically increase the facility’s reliability. Newer breakers are typically more efficient and have added connectivity and monitoring capabilities that enable predictive maintenance. These types of features can help facility managers very easily identify where faults in the system are and course correct before they even become an issue. Functionality: Older breakers typically were designed to be 6 cycle breakers compared to today’s breakers that are 3-cycle. By having a longer cycle time it increases the time to clear the fault which could expose the equipment and personnel to longer fault periods if an incident were to occur. Additionally, many older obsolete breakers are designed to withstand up to 25kA, but newer solutions typically have higher short circuit ratings. As long as the equipment is properly rated to withstand the higher rating, it can offer greater system protection from failures and exposure to arc flashes. Safety: New breakers include the latest safety features, ensuring electrical equipment is in compliance with the most current protocols and procedures helping provide employees with safer working conditions when operating the breakers. There’s a misconception that obsolete breakers can be used without risk. In reality, you’re taking a chance. Modernizing and upgrading to new technology can help reduce maintenance costs, enhance safety and provide higher performance. Read our whitepaper on improving switchgear reliability to learn how.